Quiet mooncake festival with R, Jo and HC. 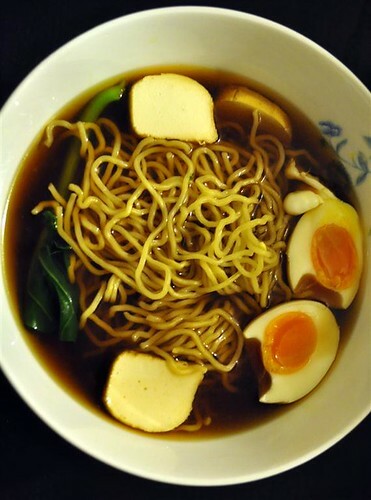 Ramen for dinner followed by mooncakes and good tie guan yin tea. Also watched cute video of Kaka slurping her noodles, she is so going to be a ramen princess when she grows up. 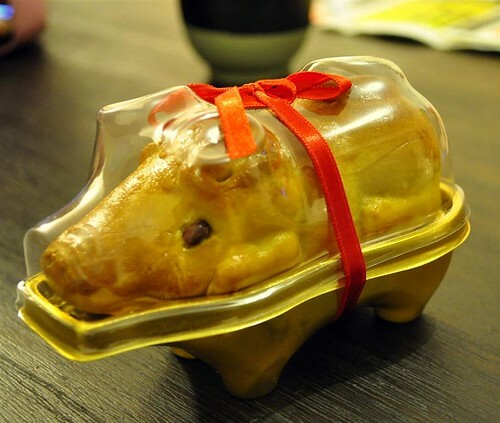 Cute piggy mooncake, very popular with the locals this year. 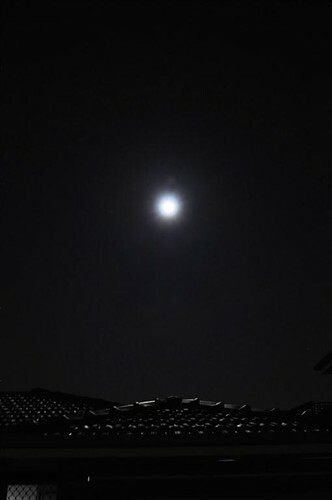 It was a perfect mid autumn festival with family. 中秋节快乐 guys. Finally arrived back in Perth. Phew. Even though I’m glad that the mind numbing long travel is over, I still feel sad. I don’t really mind that the holiday is over (even though I do wish it was a bit longer) or even the thought of going back to work. It was just really sad leaving my sister, brother-in-law and baby Kaka. 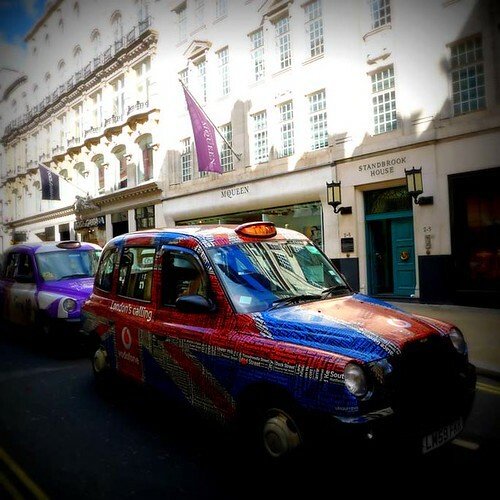 This trip really wasn’t about exploring the sights and sounds of London (even though we did a bit of that). It was all about spending time with my sister and her family and we managed quite a lot of that. It was lovely being part of baby’s life for the brief two weeks, participating in her daily activities, seeing her happy smiles in the morning, her intense focused expressions when watching Peppa Pig, her quiet happy face when reading her a story, her funny grimaces when trying solids, her joyful giggles during bath time etc. I will miss her greatly and be counting down to the days when her daitaoha yee yee can read her a story again. Of course, I would be lying if I said life with a baby was all smooth sailing and trouble free. I’ve witnessed how being stuck in traffic with a crying baby can make a red traffic light seem like an eternity. The tears streaming down from baby’s woeful face was such a heartbreaking sight and I felt so so sorry for baby (and for the stressed out parents too!). Babies are hard work and it’s been amazing seeing how my sister and brother-in-law are coping so well with being parents. They are a team. My sister is a wonderful, loving mother, Andy is such a fun, funny and caring babba. I only wish we could be around more to help out with baby. But maybe someday soon. The earlier part of 2012 was shaky and troubled. But for the past few months, I have just been feeling very lucky. Lucky because I have such a great family (this includes R too 🙂 ). And the best part is, the family is growing. Thanks for the fantastic two weeks Jan, Andy and dearest Kaka. Andy, thank you for being such a great bro-in-law, and for taking such good care of our precious sister and niece, I know that they are in good and safe hands with you. Thanks Jan, don’t be too sad, we will see you again in a few months and we can bring Kaka to try her first kolo mee in Kuching. Bye bye baby, you can’t read yet, but when you grow up, I hope this blog will still be around for you to know that your yee yees love you very very much. 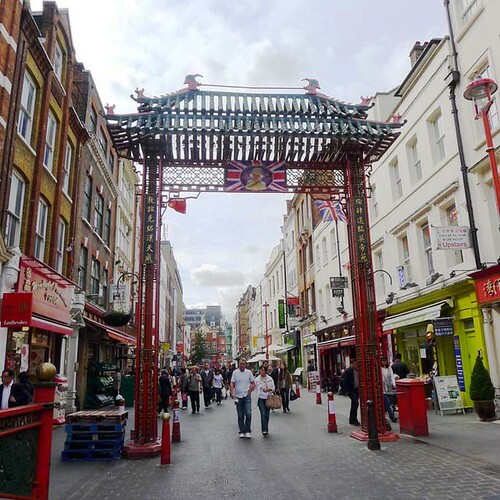 Day 13,14 & 15 London: Chinatown and Mamma Mia! It’s our last day in London today. (T__T). Jo and I will be flying out of London first thing tomorrow morning. SIGH. Never mind, let’s relieve happy memories of the past few days. Day 13 was one of our best days yet. It was the day of Mamma Mia! Again, it was an all girls sisterly outing, we all dressed up in our finest (haha, not really lah but we did dress up a little) for our day out to the theatre. Before our musical, we stopped by Chinatown (located at the West End) for lunch. Asian bakeries are the best. Sometimes when one has had too much tiramisu and cheesecakes, it’s nice to have chinese yew char kuai and polo buns. We thought about having dimsum but decided on roast bbq meats at the cha chaang teng HK Diner instead. 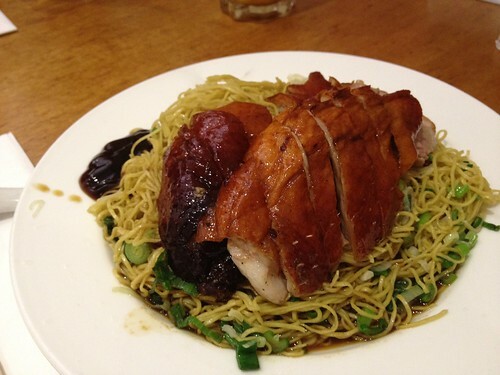 Jo’s roast duck noodles. The noodles were springy and delish. Jan’s Sam Siu Lou Meen a.k.a. 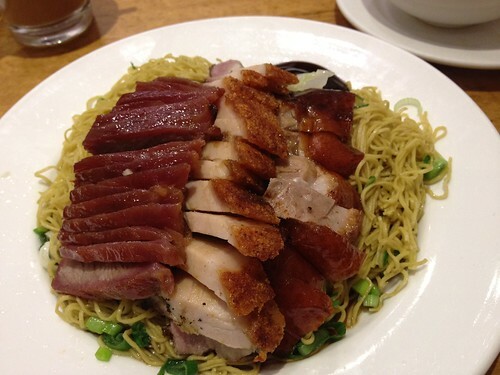 three roast meats (char siew, roast pork and roast duck) with noodles.The char siew was really nice. 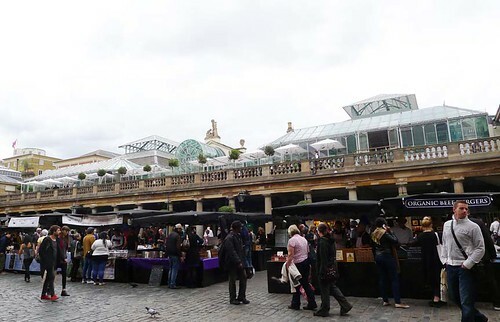 The Covent Garden outdoor market was buzzing. If we had more time I would probably have liked to peruse the food stalls, but it was time for some singing and dancing! 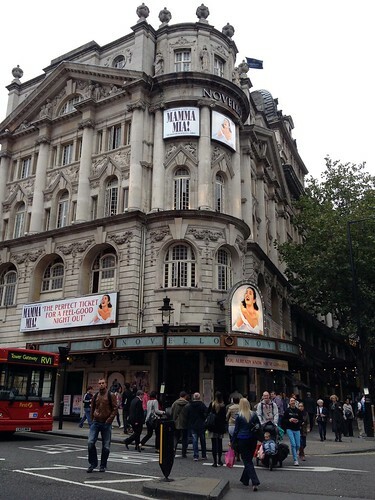 Mamma Mia was showing at the Novello Theatre which opened back in 1905 and actually survived bombings from both world wars. 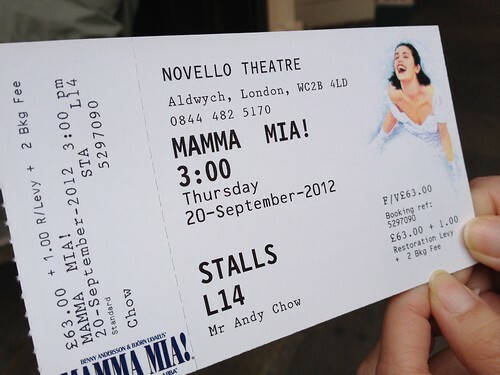 Tickets to Mamma Mia! Our super generous and kind brother-in-law bought us these tickets even though he didn’t go himself.Thanks Andy! We had fantastic seats near to the stage and right in the middle. Making our way to our seats. 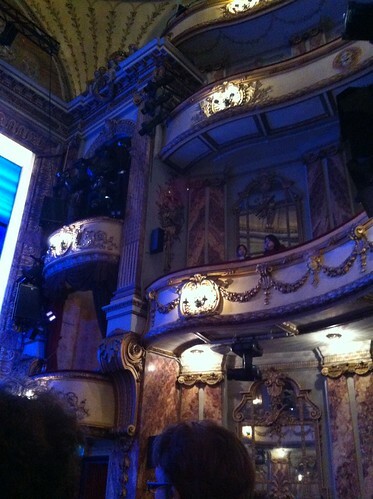 Inside the Novello theatre which was beautiful. I love English buildings because they keep reminding me of my storybooks, this felt like something from Julia Quinn novels and I could imagine dukes and duchesses in the stalls. The lights dimmed and the musical started. It was such a fun and joyful musical, we were probably the younger ones (apart from the kids with their parents) amongst the crowd and it was fantastic seeing how much the older folk enjoyed Abba’s timeless music , dancing and singing along with the cast. The cast was very good with wonderful performances. We especially liked the actress acting as Donna Sheridan, her tunes brought my sister to tears. The ending of the musical was the highlight of the show with the audience jumping to their feet, clapping and dancing along to the classic tunes of Dancing Queen etc. At one point, I looked away from the stage and turned to see both my sisters clapping, singing and dancing merrily, and I thought to myself ‘this is so good’. It was extra special because we were sharing this experience together. There were no photos from Day 14 because everyone was tired out (and feeling a bit sad because the holiday was almost over) so we just lounged about at home. We perked up on Day 15. Incidentally it was my mother’s birthday so we had some morning Skyping with my ah ma and ah pa to wish her happy birthday. They got to see Kaka show off her new bye-bye hand waving skills. 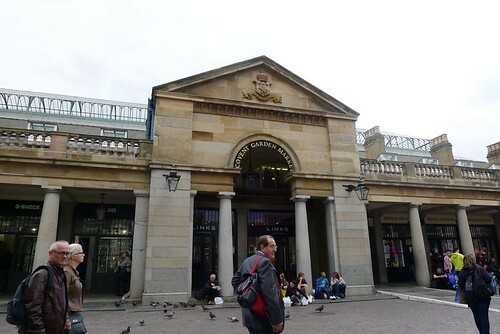 We then set off to Croydon to pick up some online shopping from Marks and Spencers (love Marks and Sparks haha). 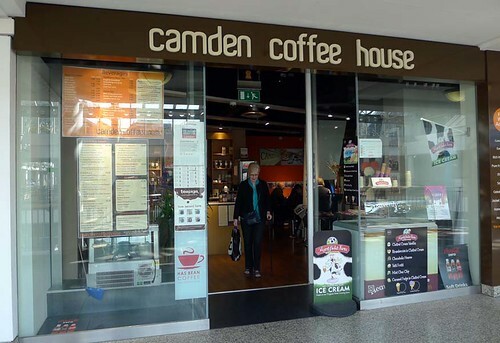 Another try at London coffee from the Camden coffee house. It was alright. 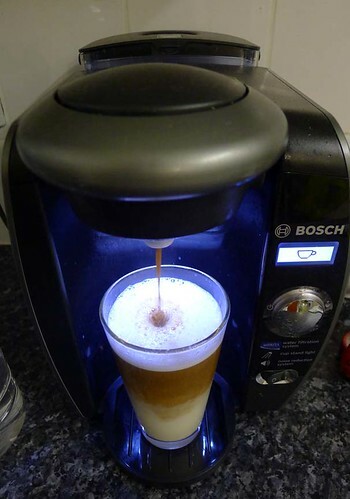 Surprisingly, the best coffee I had in London was this Caramel Latte that Andy the Barista made for me at home. Haha, I shouldn’t even have bothered with Starbucks or Costa coffee. Kaka picture of the day: Enjoying story reading time with her ‘pappa’ Andy. Kaka really loves her books and being read to. I bought her lots of new books today so she will have lots of new stories. I shall miss reading to baby (T__T). And that’s the end of our last full day in London. Sigh, it has been a wonderful trip. We went back to Kingston for more shopping on Day 12. It was a nice day. 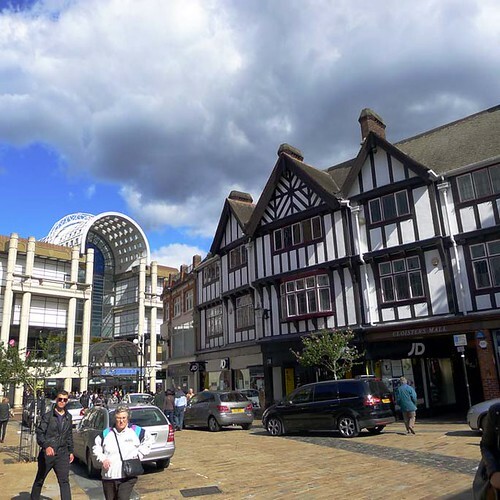 Kingston is a great shopping area with its mixture of department stores, high street stores, boutiques and market stalls. 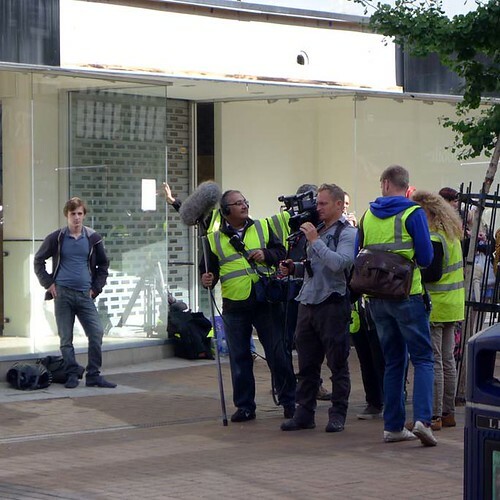 Some filming going on in the middle of the street. 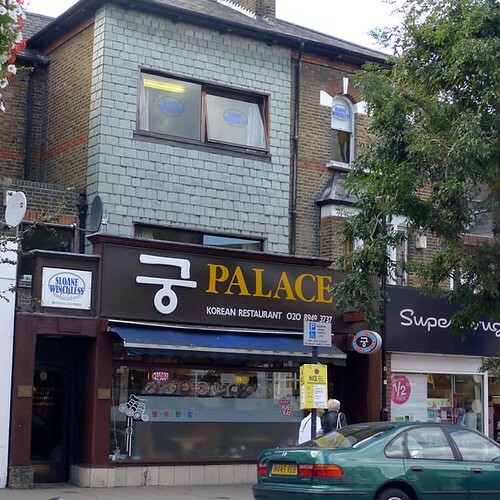 Kingston is also home to one of the largest Korean communities outside of Korea with many Korean restaurants and stores located in the suburb. It made sense to stop by the Korean restaurant Palace for some Korean lunch on the way back home. 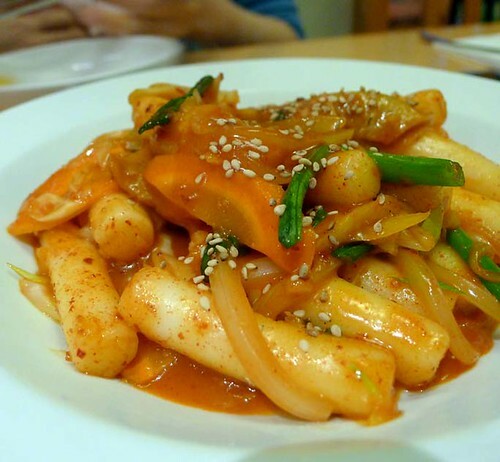 Korean food isn’t my favourite cuisine but I do like Korean rice cakes and these chilli ones were yummy. 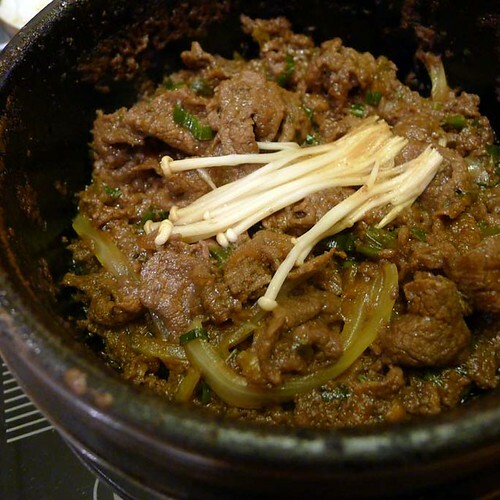 Jan had the beef bulgogi, very flavourful and tender. 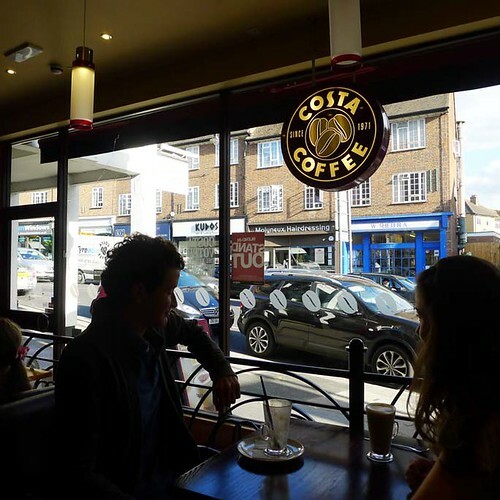 We also stopped by the suburb of Cheam and had a Costa Coffee (reminds me of Gloria Jeans in Australia). It was my second Costa coffee, the first one I had was terrible, but with a shot of caramel syrup, the second coffee was better. It was sweet to see this young couple possibly on their first date sitting at the next table. End of a successful shopping trip, we should have taken a picture of Jo’s shopping bags, she has been banned from shopping for the next few days :(. 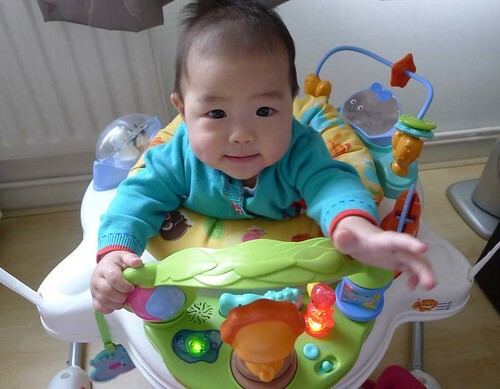 Kaka picture of the day: Kaka with her angelic smile in her baby bouncer, the determined baby has been trying to stand unaided for the past few days, it’s both exciting and terrifying at the same time. 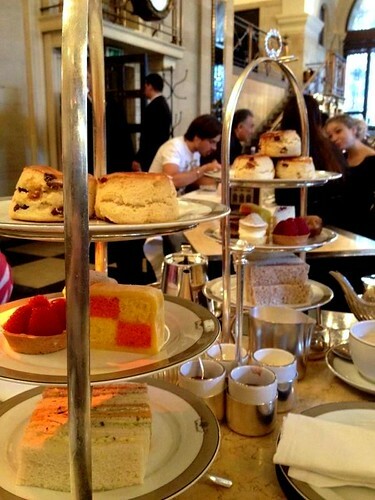 It was a much anticipated afternoon tea, just us sisters. Poor baby and Papa Andy were left at home. 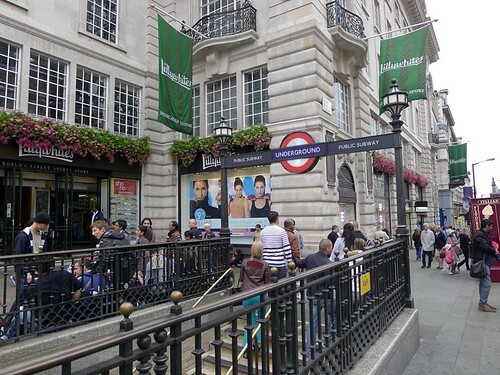 First we went shopping (more like window shopping) at London’s famous Bond Street (New and Old). 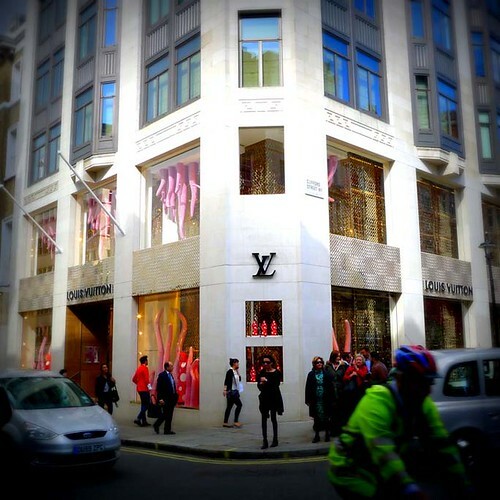 This shopping street is well known for it’s luxury stores selling designer goods. This is where you go for all the big names. This store was our real target of the day. 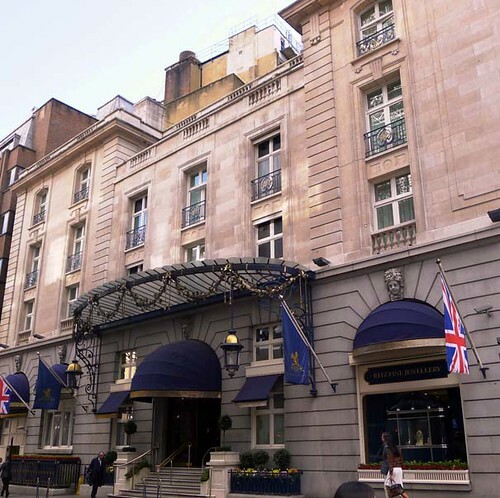 The famous and historic luxury hotel The Ritz London. 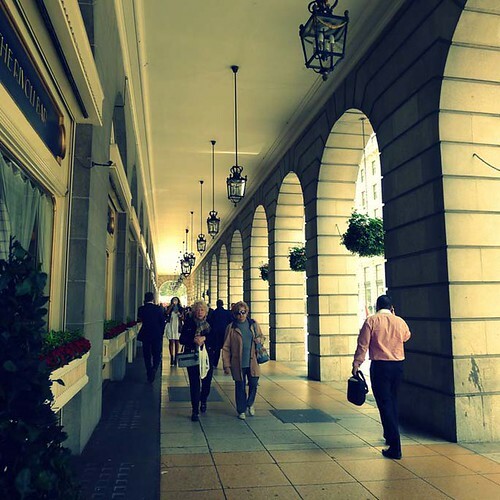 Hallways of the Ritz . 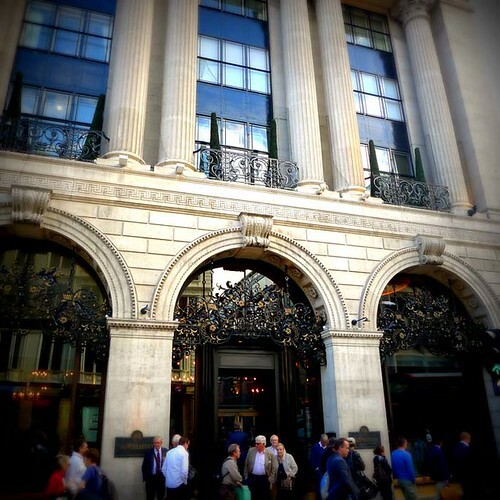 Entrance to The Wolseley. This grand building was built in the 1920s and was originally used as a prestigious car showroom. Who knew it would be perfect as a grand tearoom? It was like stepping back in time. We were blown away by the three tiered cake stand laden with delicate pastries, finger sandwiches and scrumptious scones. We all had our individual pots of tea, I had the English breakfast. 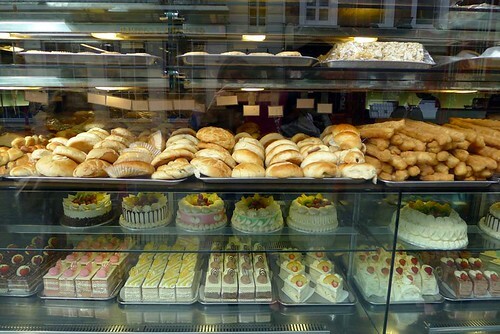 And it wasn’t even just one cake stand, we had two! Our scones were kept warm by a food cover. 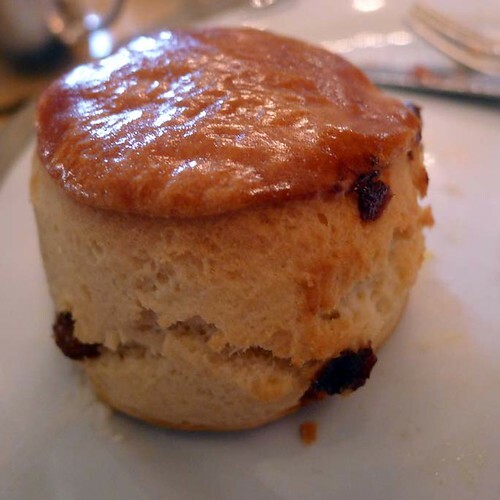 They were the best scones I’ve ever had, lovely crisp crust, not overly dense, warm. 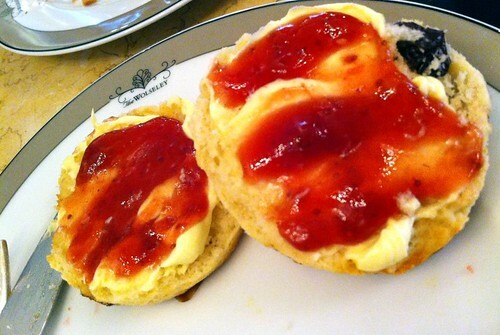 They were perfect spread with clotted cream and strawberry jam. We actually managed to finish all our scones, and we had half a dozen! 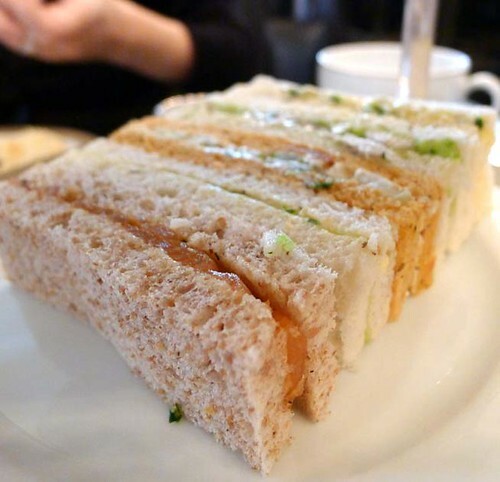 Dainty finger sandwiches that were so cute and light. If I remember correctly, we had cucumber sandwiches, goat cheese and celery sandwiches, chicken sandwiches, egg salad sandwiches and smoked salmon sandwiches. 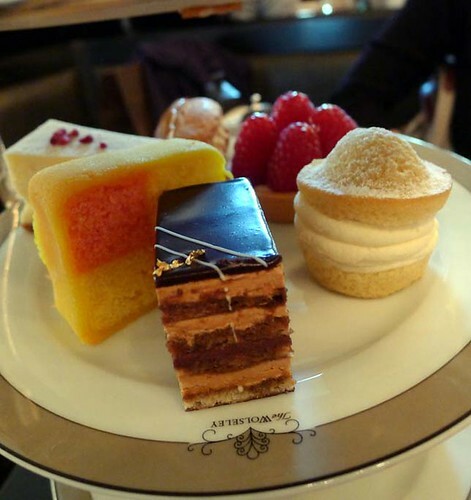 Selection of pastries included the English Battenberg cake (the check pattern cake covered with marzipan), Opera cake (the one with layers), Queen Victoria sponge cake, a raspberry fruit tart, a cheesecake and an eclair. 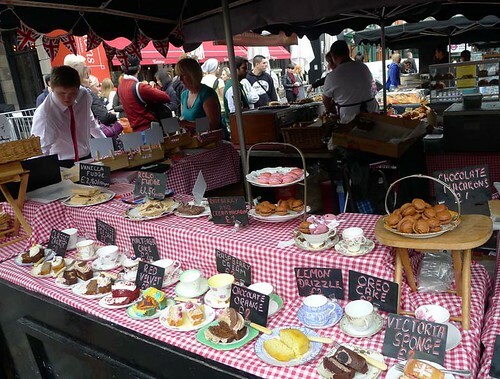 All the cakes were delicious (not a fan of the Battenberg though). 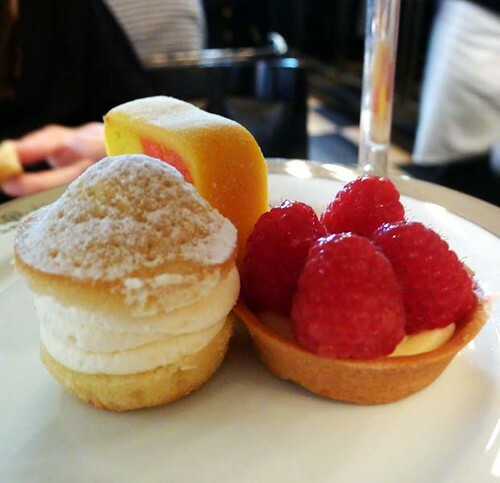 Jan really liked the fruit tart which had surprisingly light, my favourite was perhaps the Queen Victoria sponge cake which had jam hidden beneath the cream, it was yums. It was a great outing and we sisters had lots of fun. Definitely one of the highlights of our trip. 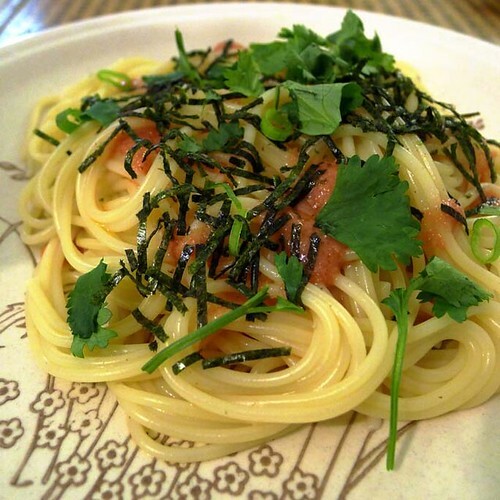 We were so stuffed after the afternoon tea but still managed to have mentaiko (spicy cod roe) pasta for dinner. So good. I wish we had mentaiko in Perth! 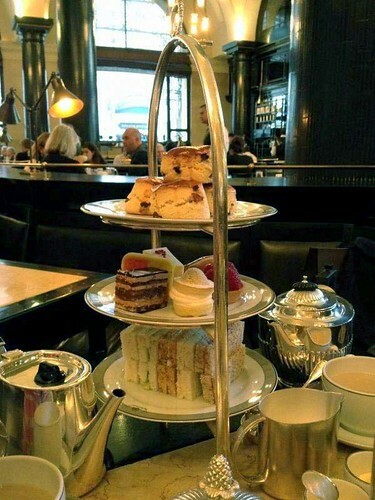 I also wish Jan, Andy and Kaka lived in Perth so that we sisters could have afternoon tea all the time (^_^). 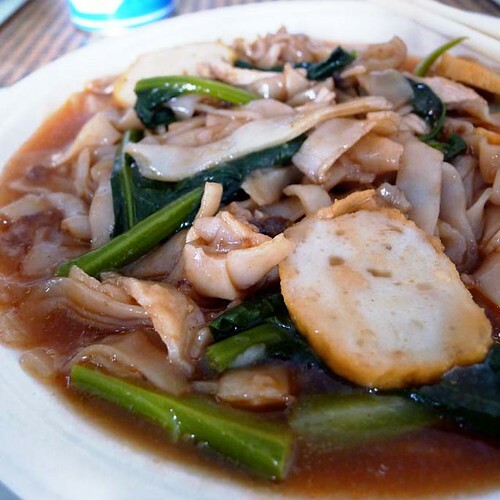 Lunch request of tomato kueh tiaw from the deprived family in London. Afternoon coffee at one of the chain store cafes in London. So far I haven’t had much luck with good coffee in London but I’m probably going to the wrong places haha. 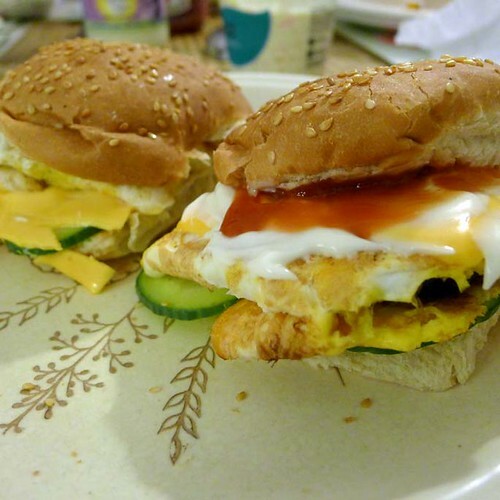 It’s quite funny that my sister actually misses road side burgers from Kuching! So we tried to recreate something similar in London. Kaka picture or rather pictures of the day: happiest when playing with mummy! 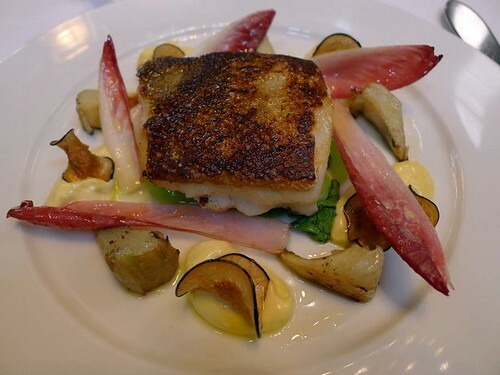 Many years ago when I was in London, my brother in law Andy treated us to lunch at the three michelin starred Restaurant Gordon Ramsay at Royal Hospital Road. 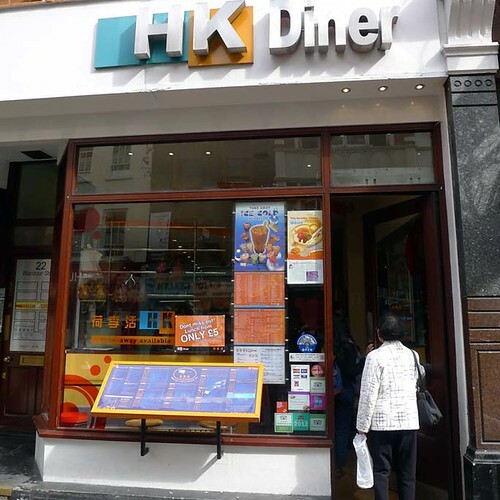 That was possibly my first and best fine dining experience ever, I still remember the dishes, the atmosphere, the ultimate foodie experience to this day. Fast forward many years later, Jan and Andy were once again bringing us to try fantastic food in London. 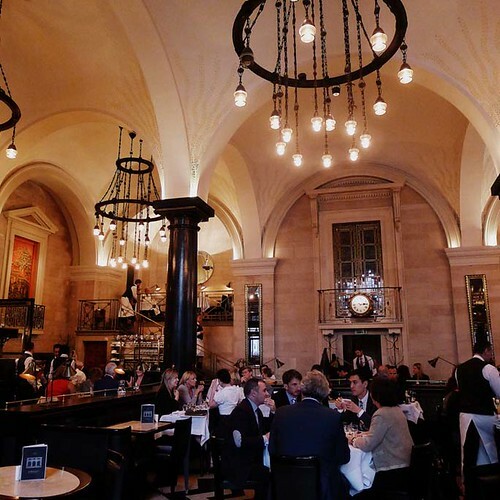 This time it was one of Jan’s favourite restaurants in London, Galvin La Chapelle. Jan loved this multi award winning French restaurant even before they received their one michelin star. She raved about their dishes and I was really happy that we were getting to experience it for ourselves. It was quite a chilly day in London. 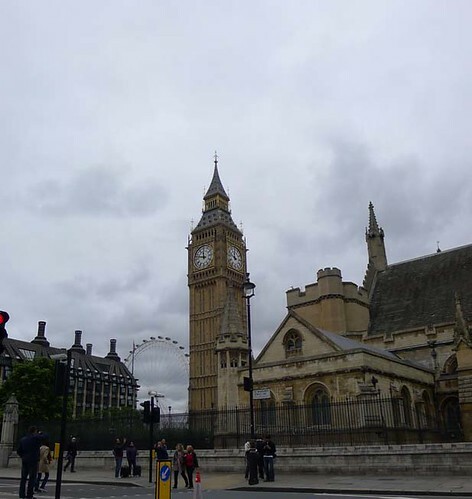 Obligatory photo of Big Ben and the London Eye in the background. 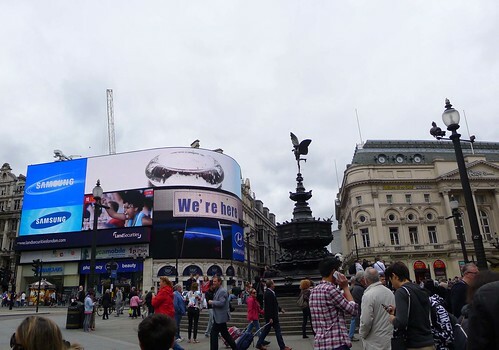 We parked our car at Piccadilly Circus and took the tube to the Liverpool Street station. 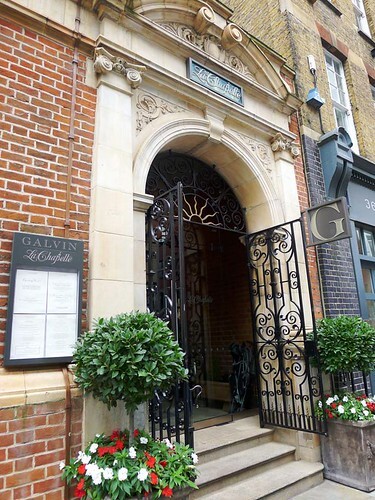 Entrance to Galvin La Chapelle. 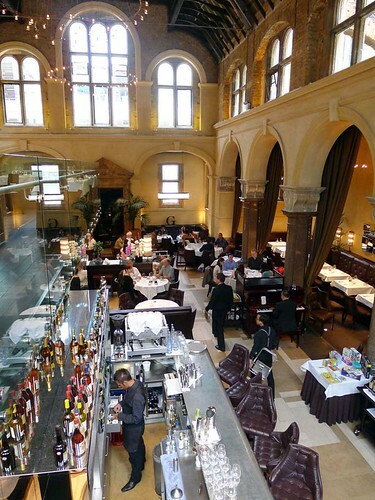 The restaurant is located in a grade II listed building with was formerly a Victorian school chapel. Gorgeous dining space with soaring ceilings, majestic pillars and velvet drapes. We were also greeted by live piano playing. It was just a very beautiful and grand building with lovely lighting. We all had the Menu Prix Fixe (around £30) which was a three course lunch with five choices for each course. 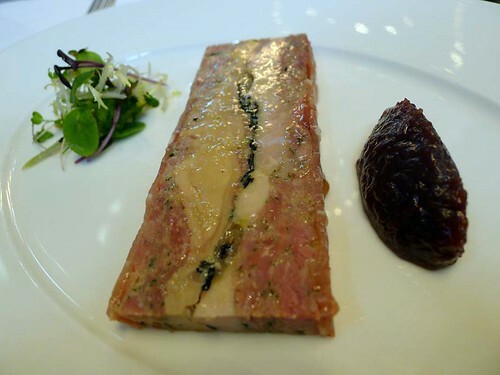 My entre was a terrine of pressed guinea fowl, ham hock and foie gras with red onion marmalade.This was really tasty, salty, sharp, creamy and sweet from the red onion marmalade. I really enjoyed it. 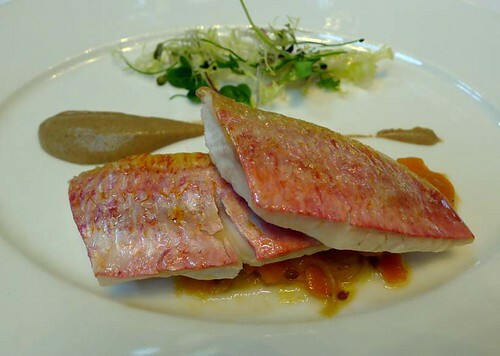 Jan’s entree was escabèche of Cornish red mullet, spiced aubergine puree and herbs. According to wikipedia, escabèche is a typical Mediterranean cuisine which refers to a dish of either poached or fried fish. I remember Jan asking the waiter about this dish but forgot what he said haha. Foodie fail. I don’t think Jan enjoyed this dish as much because she doesn’t like fish and this one was spiced quite heavily. 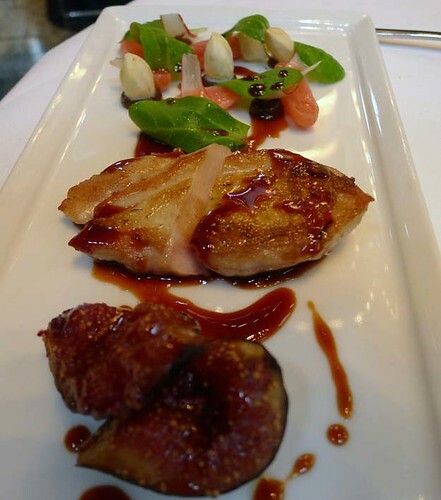 Jo’s entree was roast breast of red leg partridge, glazed fig and cobnuts. This was another lovely dish, the pickels on the dish offset the sweetness of the figs, the partridge was really tasty too. My main was roast Icelandic cod, Italian artichokes and aioli. I liked this dish but preferred my entree. The cod was nicely done, oily and moist, but I wasn’t a fan of the bok choy underneath or the aioli which was really rich and buttery in flavour. So the overall feeling was a bit too salty. 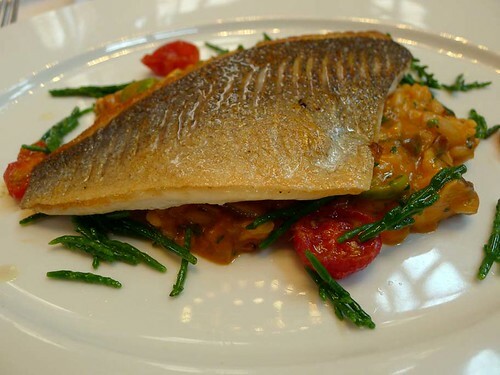 Jan and Jo both had the crisp fillet of sea bream, San Marzano tomato and mushroom risotto. This was really yummy, Jo and Jan loved it, and this is despite both of them not being fish lovers. Jan says the sea bream was cooked to perfection with a wonderful crispy skin, the tomato gave it a burst of freshness and the mushrooms in the risotto was just lovely. 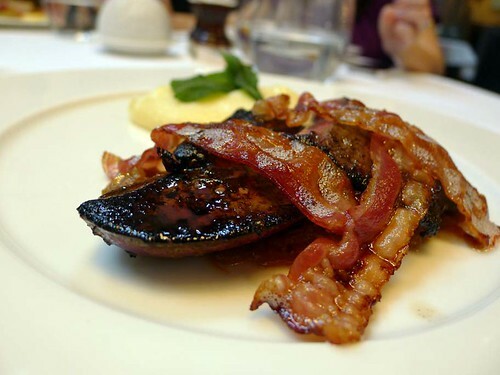 Andy’s main was the tranche of calf’s liver, pommes mousseline (mashed potato) and pancetta. He enjoyed his dish and gave me a bit of his calf liver to try, I really liked it and in hindsight wish I had ordered it. Dessert time!! All the women had the soufflé of English raspberries with mint ice-cream. 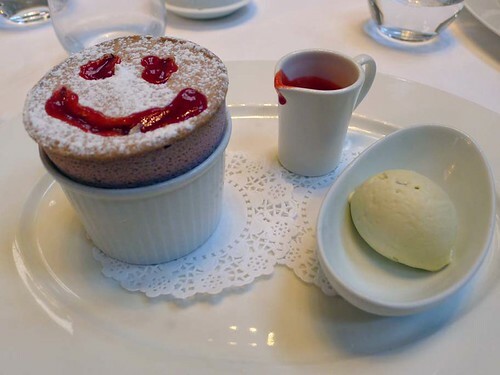 The waiter gave us different patterns for our souffle, Jo got a smiley face, she was delighted haha. This was my first soufflé and it was fantastic, really light, airy with the tartness of the raspberries, it went really well with the mint icecream which was soo good. 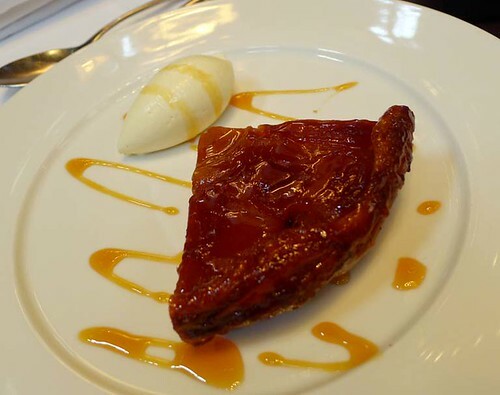 Andy’s dessert of apple tarte Tatin with crème fraîche. He said this was good but he’s not a fan of sweet things haha. Kaka had her first fine dining experience too. I’m not sure she liked the food hehe. Overall it was a wonderful fine dining experience. 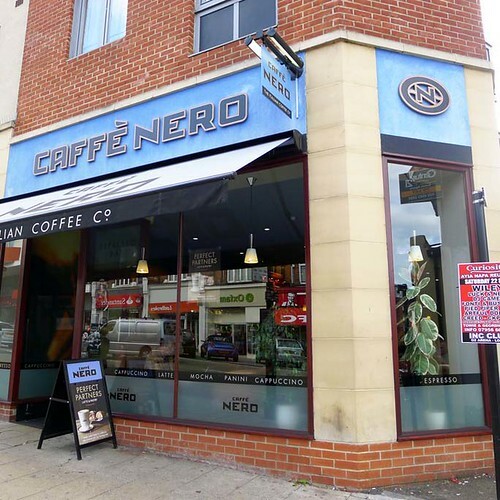 The food was great, service was exemplary, and the dining space and atmosphere was just wow. Thanks for bringing us Jan and Andy! Happy (^__^). 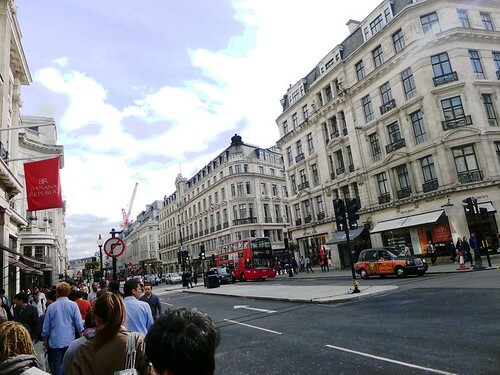 After lunch, it was shopping at the famous Regent Street. 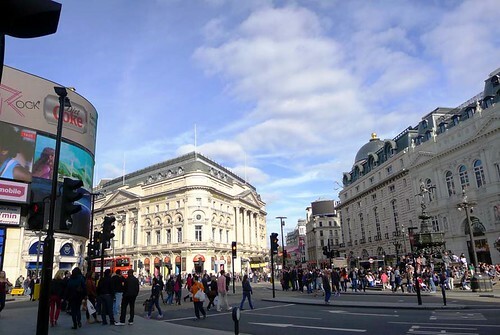 Another look at Picadilly Circus. 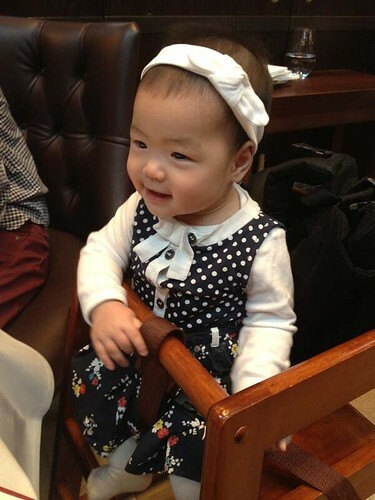 Kaka picture of the day: All dressed up for her first fine dining experience. 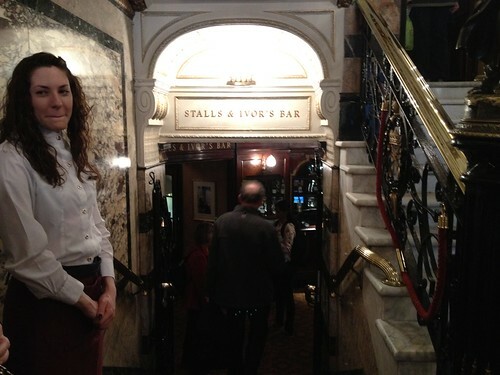 Even the waitress commented that she was looking chic!